The Klin Group has announced an exciting three-year agreement to become the sponsor of the newly named Young Kilmarnock Club until the 2016/2017 season. Young Kilmarnock (YK), previously called ‘Young Killie’, has over 500 members and aims to promote, increase and develop football participation and encourage children to participate in physical activity. Marie Macklin, CEO of Kilmarnock-based Klin Group which specialises in property development and regeneration projects, met with members of the club during ‘Saturday morning football club’ as the new shirts were unveiled. Over 200 young club members attend per week. 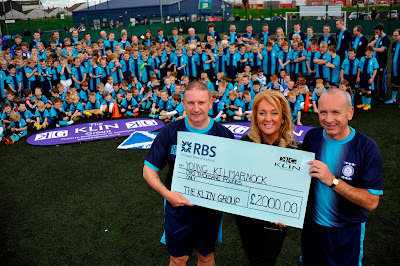 Marie had originally committed to sponsorship for the 2013/2014 season, but after visiting Young Kilmarnock on Saturday to present the cheque, was so impressed that she has committed the Klin Group to a further two years sponsorship, up to and including the 2016/2017 season. Scott Geddes of Young Kilmarnock (YK) said: “We’re thrilled to have Klin on board as our major sponsor. We know they are passionate football fans who are committed to Young Kilmarnock. Young Kilmarnock is an independent organisation run by volunteers, with over 500 members aged between 4 and 16 years. We will continue to strive to increase our membership and membership benefits, promote Kilmarnock FC in our local community and maintain our position as one of the best junior supporters clubs in the country.